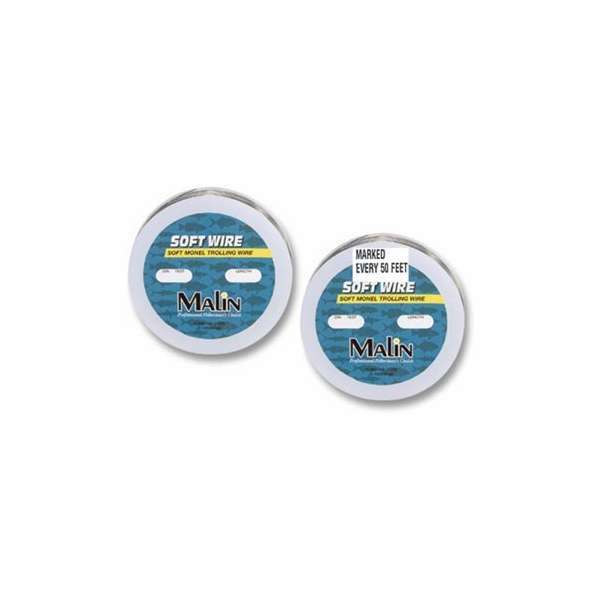 Malin's solid soft monel trolling wire possesses superior properties that make it the ultimate trolling wire for fresh or saltwater. These properties give it exceptionally good resistance against kinking, corrosion and abrasion. It sinks faster and stays deeper than soft stainless steel due to its high density. 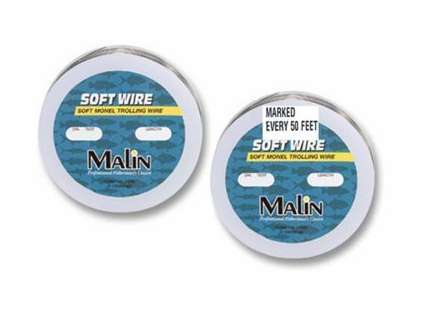 Soft Monel trolling wire is the number one choice among experienced wire line anglers. The wire line works fine, the marker indicators could be rethought. The indicators are large blobs of hard plastic at least 1/4" diameter. They would make it thru the carboly guides but jam at the level wind (Shimano Tekota 800). I ended up using them as guides to add shrink tubing every 50'. Just crushed (carefully) the blobs off and then put small twists on the wire. Over the twists I shrunk the tubing, which also happen to be color coded and easier to see. ProsPre-marked, no measuring needed when adding new indicator marks. ConsPlastic blobs used as markers to big to fit thru level wind. Also blobs aren't easy to see, they're off white. This wire makes stainless steel seem ancient and archaic. Dives consistenly and sits on the spool more like lead core than wire. 50ft beads allow depth control to be more precise and the softness of the wire makes connecting dacron a cinch. No brainier for bunker spoon trolling. Hate the price but like the line. Doesn't kink nearly as much as stainless. Much easier to do haywire twists in. Malin brand has treated me well. Indispensible tool./ I have hardly fished for stripers and blues with anything but wire for 2 months now. Now, where's that other spool? We are a retailer of Malin products we currently only have the 300 yard spools usually the maja spoons are trolled without weight. Speed will greatly determine the desired depth. Whats the difference between M50 & PM50? The PM50 model is marked every 50 ft.
We can do that. The connection would be made with a barrell swivel. If you want to order this, please call and place the order by phone.